I have had 3 kids, my youngest is now 5. I’ve spent the past couple of years sorting through baby supplies. It’s taken me years because I have struggled with closing that baby chapter in my life. I love the memories that come flooding back to me as I look through my boxes of baby items. I have sold most of the items, gave away a few things, and saved a couple of special items to help remember my sweet babes. As I’ve sorted and cleaned I’ve realized that so many of the items I thought were necessary, actually weren’t! 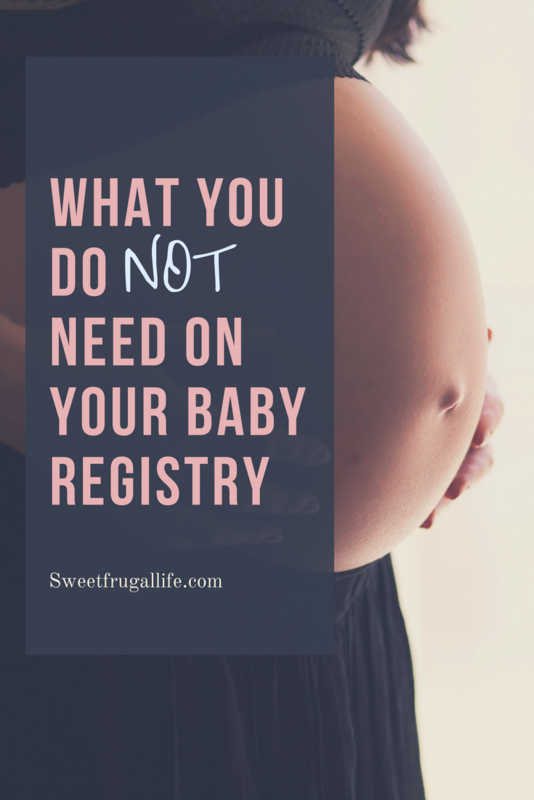 There are many articles out there telling you what to add to your baby registry, and a lot of them have some good advice…but I think so many of the things we THINK we need….we actually could do without! I have come up with a list of 15 items you do NOT need to add to your baby registry. I also added some alternative, more frugal options to consider. I really wanted a beautiful car seat cover with a fun design. It’s all I saw while at the grocery store. So, I bought one. It was cute and trendy and looked good on the car seat. And then…2 months later I took it off and it stayed in the closet for the next few years until I gave it away. Frugal Option: A great alternative is just to put one of the many baby blankets over the handle. Blankets are something you always have on hand and are just the right size to cover the car seat with. Baby food makers look pretty and claim to offer convenience and ease to all your baby food making. While that might be true, it is not a necessary item. You CAN make baby food without it. Frugal Option: Baby food is very easy to prepare just by using a pot and a blender. It only took me an hour or two to make large batches of baby food and I did it without a baby food maker. Let’s face it, little tiny baby shoes are adorable! So many colors and styles…and oh so itty bitty! However, as darling as those little shoes are, babies don’t really need to wear shoes until they are walking. Frugal Option: Baby socks are necessary for those sweet little toes. Instead of buying shoes, buy some cheaper socks. Find some that have a cute style. I love these socks that look like shoes. I will agree that baby nail clippers were useful for trimming up those tiny baby nails. However, when I threw mine away I realized I really could have done without them. Frugal Option: Most people already own a pair of nail clippers. These would work just as good for babies as they do for adults, you’ll just want to be extra careful not to clip any of that sensitive skin. I was really excited to buy cute hooded towels and small baby washcloths for my babies. But, I have come to learn they just aren’t necessary. Frugal Option: Use a towel you already have at home! They will work just as good and your little one will never even know the difference! If you are planning on nursing you probably will want something to help you cover up while in public, I know I did! You really don’t need to buy a special cover for that though. 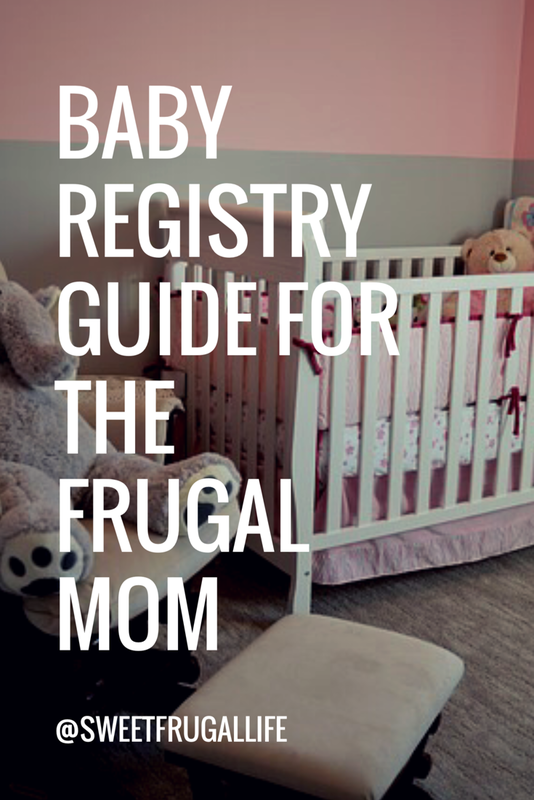 Frugal Option:: I found that a large light weight blanket worked just as good as a nursing cover, and I always had it in my diaper bag anyways. One less thing to pack! A baby bathtub was an item I thought was so important to buy when I had my first baby. In hindsight, it was handy for a few months, but then the babies just grew out of it in a few short months and the tub was stuck sitting in my basement. Frugal Option: If I were to do it all again I would purchase this Bath Sponge instead of a fancy tub. It is much cheaper at only $6.39 and it won’t take up as much space. This would be a much more frugal option. This is another one of those items that I thought I just HAD to have. I ended up not using my boppy pillow as much as I thought I would have and I have since decided it really wasn’t worth the money. Frugal Option: I found that I preferred nursing with a couple of small pillows under my arms instead of the nursing pillow. I was able to smash them in a way that felt most comfortable and I didn’t have to worry about the bulky nursing pillow. Changing tables are so pretty in all the magazine nursery pictures. But, once your baby grows out of it, they really aren’t super functional. Changing tables usually don’t have a lot of drawers or great organization. I found I needed to buy a dresser later on to help supplement with space. Frugal Option: Instead of buying a changing table AND later a dresser, how about just buying a dresser. Try to find a short dresser so that it will be the perfect height to changing your baby on. While we are discussing changing stations, let’s discuss the changing pad. You’ll find all sorts of different changing pad shapes and sizes and all the darling patterns for a cover to go with it. These are cute and fun to buy, but really not necessary. Frugal Option: A couple of soft towels (that you already own) folded up and placed on the baby dresser will work JUST as good for a changing pad. They are easy to throw in the laundry and clean, and they are free (big win!)! You will find a diaper pail on almost every baby registry idea list. I do believe they can be convenient and very useful. But, they can also be really expensive, especially when you have to buy the pricey refills (which you will need to do….A LOT). Frugal Option: We had a cheap trash can next to the changing table (I should’ve chose a dresser!). With all the late night diaper changes with newborns, it was very nice to have somewhere to put alllll those diapers. I would change the bag daily and fortunately newborns messy diapers usually don’t smell bad! After about 4-6 weeks, once baby starts sleeping a little longer at night, I just started taking the messy diapers out to the dumpster outside. It only took a few minutes and felt good to get a little fresh air. I’ve seen these fancy diaper organizers around for a long time. They look really cute in a nursery and I can see the appeal for them. I don’t however think they are must have. Frugal Option: How about use one of those top drawers of the dresser (aka changing table). They will be within arms reach during diaper changes, and it didn’t cost you anything extra! It’s also so nice to have them concealed away. Baby wipes are cold and you might feel a little guilty wiping the baby with a cold wipe. The problem is that you won’t always have a wipe warmer with you, so it would be good for the little one to get use to the cold wipe right from the beginning. Frugal Option: I unfortunately have no frugal alternative for a wipe warmer. I’ve found that babies really do get use to a cold wet wipe. So, just use them as is and save yourself some extra cash. My babies slept much, MUCH better with a little white noise next to them. You do NOT need a sound machine though to accomplish this. Frugal Option: You can download white noise apps for free on your phone or ipad and place them in babies room while they are sleeping. Or, we just used a small cheap fan. We placed it next to their bed and pointing it away from. Our babies slept great this way! I’ll start with a disclaimer…..I actually never fed my babies a single bottle….so you can take my advice on this one with a grain of salt. I have seen the bottle drying racks in ads and have always assumed that even though they look super fun and handy, they just aren’t very frugal. Frugal Option: How about just placing your bottles upside down on a dish cloth and let them air dry. A dish cloth should work just as well as a drying rack, but wouldn’t cost you a thing! What baby item did YOU buy that you wish you hadn’t???? 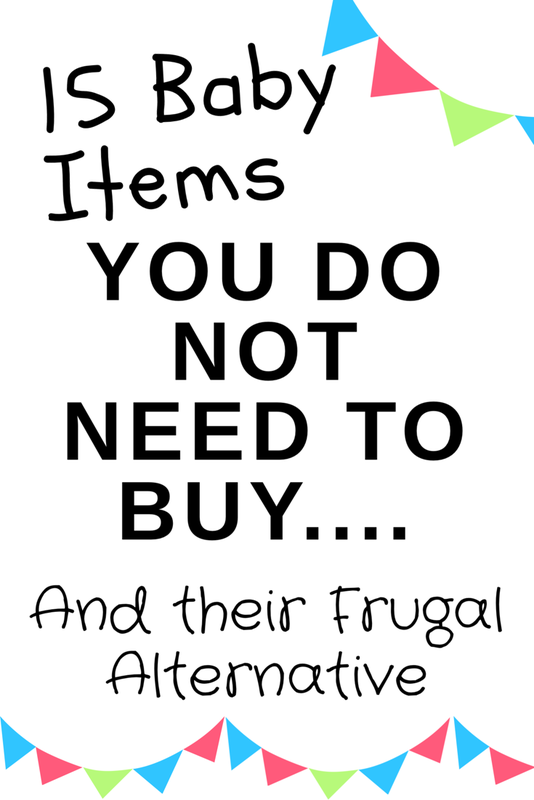 Let me know in the comments all your Frugal Baby Alternatives!